During the night of New Year’s Eve you cut through a double-fence perimeter to allow a pack of captive wild wolves their freedom. Once outside the confines of their fences, you imagined the wolves would quickly melt into the surrounding 80,000 acre forested wilderness. You’re certain they have waited their whole lives for this moment and that they would realize the great joy that comes with freedom. On signal from the alpha male, they would just head into the safety of the dense forest, happy in the simple act of trotting unimpeded through dozens of miles of snow-covered trails. You were confident, weren’t you, that the alpha couple would use their “natural” survival abilities to get a bearing on this new world; that the youngsters would be playful and eager to explore; that the pack’s pent up energy, born of years of captivity, would allow them to move swiftly so that in a matter of days they would be far from their former prison and captors. You imagined that they would eventually meet other wolves, establish a territory, and hunt beaver and deer the way their ancestors have done for millennia. Yes, you were so sure that thanks to you, they would again be wild wolves. Well Liberationist, life is not the Disney movie that you play in your head. Let me tell you how it really went so you can know exactly what kind of a hero you are. On New Year’s Eve 2012, you cut through the two perimeter fences that surround the wolf enclosure of the Haliburton Forest Wolf Centre in Haliburton Ontario. 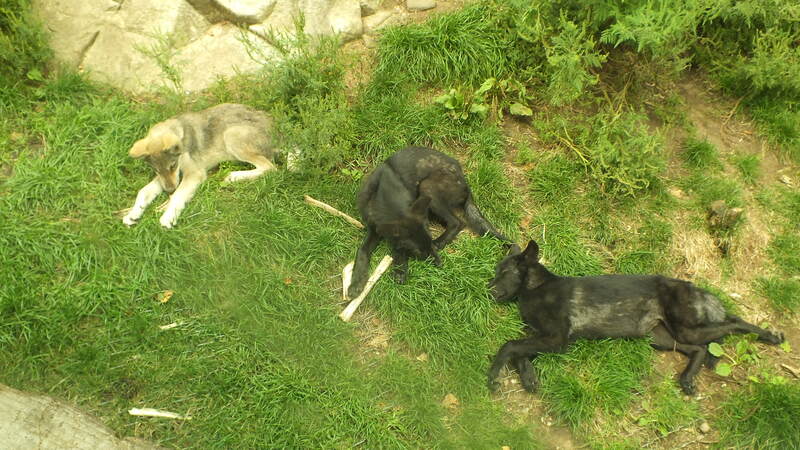 That night, four wolves left the enclosure: the alpha pair Haida and Granite and two of their juvenile offspring, Logan and Lonestar. 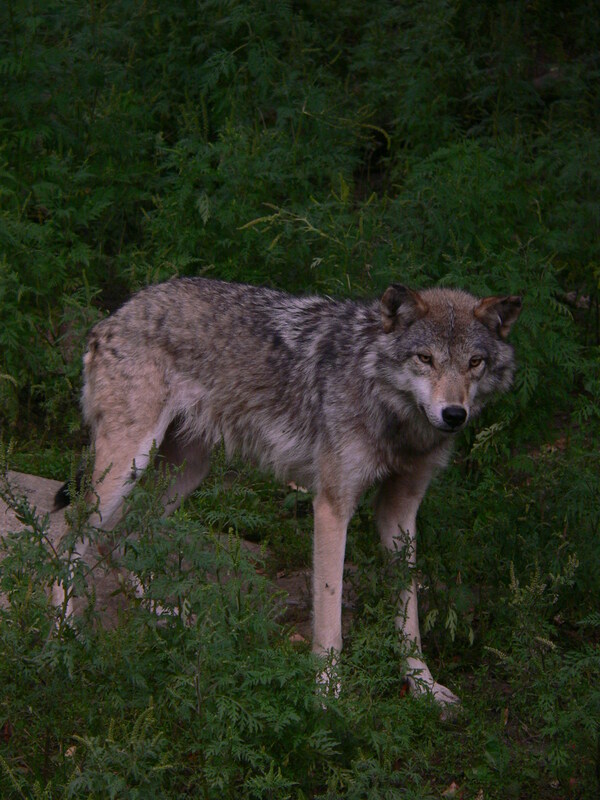 Five wolves – two juveniles and three pups– remained inside the enclosure. 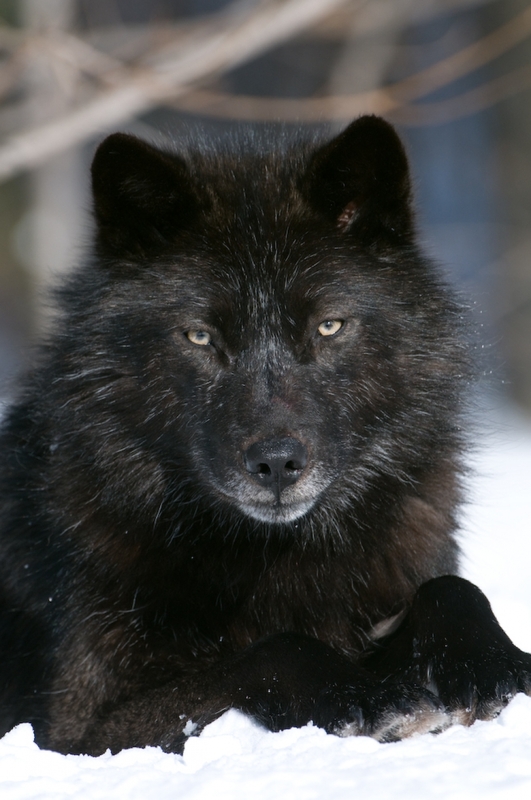 By 10:00 the next morning, one wolf was dead, shot and dragged away by an unknown assailant. Liberationist, did you plan for this? Did you think for one minute about how people were going to react to a large black Timber wolf standing at the roadside? It was first thought that the dead wolf was Haida, but later it was confirmed to be Logan. (Father and son are both black) Eleven days later Granite was found critically injured, also shot, probably at the same time as Logan. Thanks to you, Liberationist, Granite suffered from her injuries (the result of 2 bullets) for almost two weeks, losing an enormous amount of blood in the process. Did you see the pictures? So now Liberationist, you have the blood of two dead wolves on your hands. Not only that, but did you know that Granite was the only adult female in the pack? Yes, she and Haida were the parents of all seven youngsters. Luna, Leila, Logan and Lonestar were born in 2011. Molly, Maple und Maya were born this past summer. They are only 7 months old. Thank you Liberationist. You have destroyed a family. What we have inside the enclosure now are 3 pre-schoolers and a pair of adolescents with no parents. As of this week (Jan 20th) they are panicked and stressed. The little ones are anxious and skittish, dashing into dens at the least provocation. The older ones are constantly on alert hoping to hear or smell their parents and siblings. Of course they have no idea their mother is dead. They just know that there are no adults around. That, in itself, is cause for panic. You see, Liberationist, without direction from their elders, young wolves are unable to cope on their own. Haida and Lonestar are hanging around the wolf centre. I know you thought that they would take to the forest with joyous abandon, but no. In all these weeks of “freedom” the loose wolves have seldom left the immediate area. They too are stressed and confused at being fenced out of the only home they know. All efforts (and there have been many) to get the outside wolves into the enclosure have failed. Let me be clear here: This is NOT because they don’t want to be inside. It’s because getting them in without letting the youngsters out is tricky business. Now I’m sure at this point you are wondering why they don’t just let the young wolves out and allow the remaining pack to be on its way. This, Liberationist, is where you reveal your total lack of understanding of how wolves in general, and these wolves in particular, operate. First of all, there are already three packs of wild wolves utilizing the surrounding Haliburton forest. As much as you might wish for a happy merging of the Haliburton wolves into that community, this will never happen. In fact, right now Haida and Lonestar may be at risk out there in the open without their pack to support them. If you had done any amount of homework, you would know that the Haliburton wolves you tried to free were the most recent members of a multigenerational wolf pack that have resided here since 1993. They have a long and complex family history. Every time I have visited the Wolf Centre I have come away impressed with the deep and intimate knowledge the staff have about these wolves. They can recite the succession of alpha males and females as easily as they might talk about their own families. They reminisce fondly over the “Reign of Trats,” long time alpha male (1996-2003) and the founding father of the current pack. 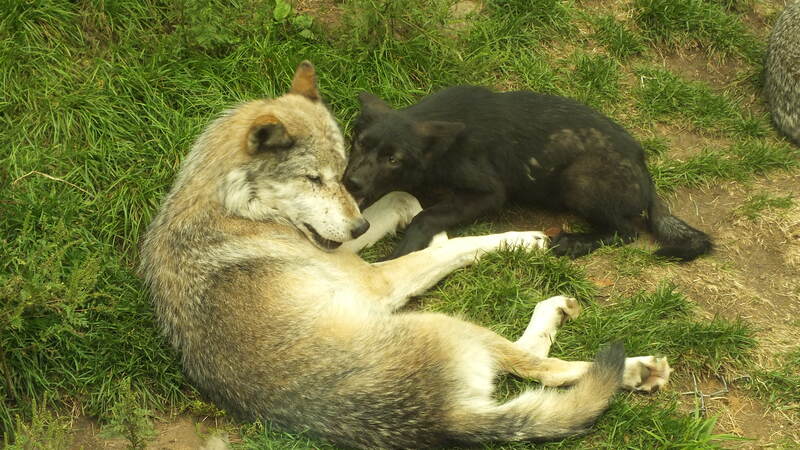 They speak sadly of the unexpected death of alpha female, Citka, during the birth of her pups in 2009. And they smile with pleased relief, that after 3 years of no new Haliburton pups, Haida and Granite delivered four healthy offspring in April of 2011. One of those is dead now. The other three are motherless. So now that you know about the wolves, let me tell you about the “prison” from which you “liberated” the wolves. The Haliburton Wolf Centre is a 15 acre fenced enclosure. It is the largest captive wolf enclosure of its kind in the world. Within that fence are a pond, miles of trails, dense unbroken forest, sunny meadows, rocky crevices to be used for dens, hills and valleys, and a full complement of small wildlife. The wolves are treated as wild and are not acclimated to humans. The staff does not handle them, feed them by hand, trap them, or make attempts to approach or engage them. * Within their enclosure the wolves are free to travel where they want, breed when they want, establish their own pack hierarchies, and even fight to the death if that’s what it comes to, all without human interference. In short, the Haliburton wolves live and die by natural causes, just as wild wolves do. In fact, with only one exception, the Haliburton wolves enjoy every experience a wild pack of wolves would enjoy. That critical exception is hunting. Because of the fence, the wolves have to be provisioned with the bulk of their diet, mostly road killed deer and trapped, skinned beavers. Do you see where this is going Liberationist? The Haliburton wolves don’t know how to hunt. You see, wolves are not born with hunting skills. Sure, the urge to hunt is there, but they have to be taught by their parents and practice those skills if they are to be any good. After generations of captivity, how did you expect the wolves to get food, especially seeing as there were only two adults in the pack? You thought Haida and Granite could support themselves and all seven youngsters? Really? The viewing area, taken from the hallway. 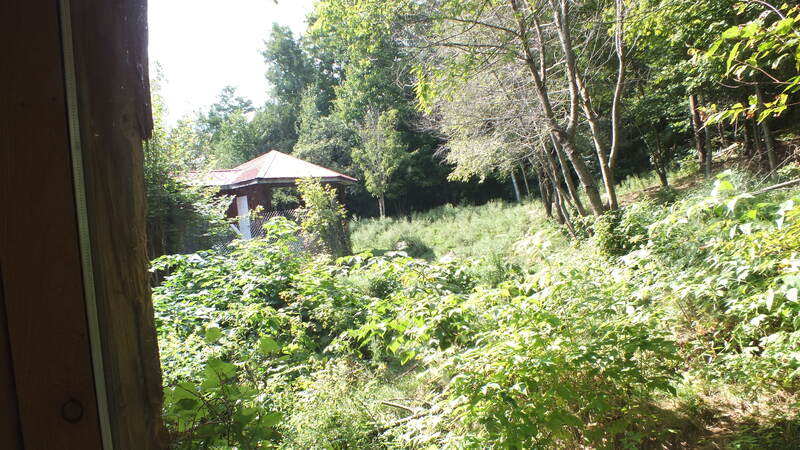 Forest and clearing are inside the enclosure. At one end of the wolf enclosure is the information center with a viewing room where visitors can see the wolves if (and only if) the wolves choose to approach the building. To be clear, the wolves are not “on display.” The visitor center overlooks only a tiny corner of the fifteen acres. You may well pay your $11 and not see a single wolf and there is not a damn thing you can do about that. If you are to see them, it will happen on their terms, not yours. But if the wolves do come down, prepare to be enthralled. The glass is one-way so the wolves cannot see you and visitors are cautioned to keep their voices down. I speak from experience when I tell you it is a quiet and respectful place, especially when the wolves are present. You never feel like you are watching zoo animals or that the wolves are being exploited. Quite the opposite in fact. You feel privileged to be graced by their presence. Did you bother to take the time to learn any of this before you cut that fence? Or was your action just about making yourself feel noble without regard or respect for the animals you ultimately destroyed? All photos by me except those from Haliburton website. * The only exception to this is that newborn pups are routinely removed from litters to control the population of the pack. Obviously the acreage can only encompass a certain number of wolves, so this is necessary. 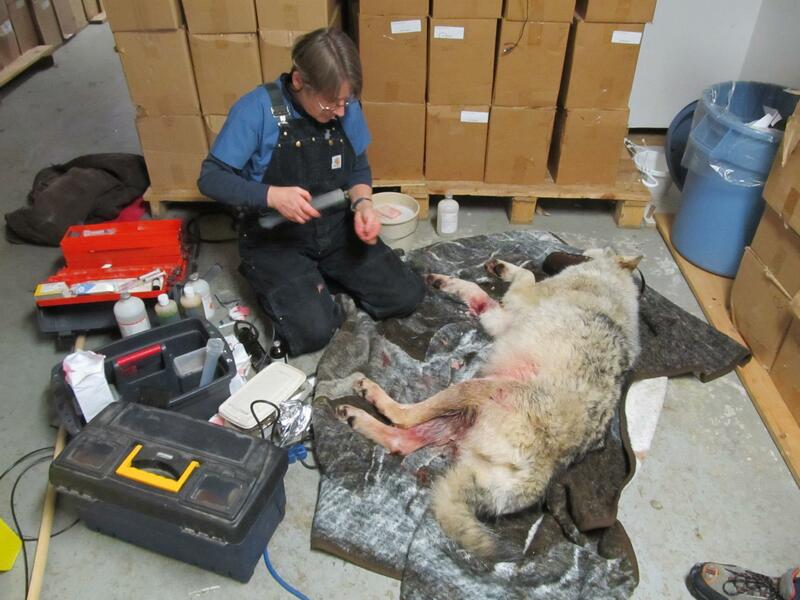 The pups are removed selectively and are donated to other wolf research facilities. This is preferred over using birth control because maintaining a natural breeding cycle is important to a wolf pack. I read about this in the news just after it happened, Kim, and you have so eloquently expressed the outrage and anger and grief I felt. How tragic that some ignorant, self-righteous fool destroyed the lives and family of the Haliburton wolves. I hope they come to hear about what came of their actions. Better still, I hope they read this post. I also hope Haida and Lonestar make it back home safely. Please write another post to tell us what comes of the situation. I hope it is some degree of happy ending for the survivors and not just a sad epilogue. “We, as ordinary civilians, are told we lack the training and the jurisdiction to release such animals into the wild, but in the absence of official action we support the responsible transfer of predators back into their former homelands, without waiting for the approval of the US Fish and Wildlife Service…. …Critics will claim that such actions are irresponsible, both for the animals and humans involved…. People who love animals did not let these babies out to be killed by some of the worst living things on this earth. ALEC does not want animal lovers. They are destroying real wildlife education everywhere. The same beasts let one of Idaho’s Wolf People’s old, raised by people out. Idaho ALEC! not people who care about wildlife.. put out a kill order that said ” Shoot in the body, not the head”.. don’t blame kind people, for what the worst of humans did.. Canada is continuing it’s sick massacre.. damn them, and Idaho, Montana.. Alaska.. It is so sick. It also underscores the need for greater engagement between both fields (and the people in those fields), generally considered separate. ALEC does not want honest wildlife education. Because the ALEC state of Idaho has worked hard to destroy wolf people, I am certain their wolf killers let your babies out.. and got a double tragedy,, they bashed animal lovers as they killed a wildlife education facility.. The US and Canada have been destroyed.. Princeton agrees. It makes me so very angry, the trashing of any place to honestly learn about wolves.. ALEC has destroyed the US and Canada.. They have no morals. They are wildlife killers, and are liars with no conscience..